I want to share with you today how to make those sweet earrings that my one student Sara made out of Shrinky Dinks. 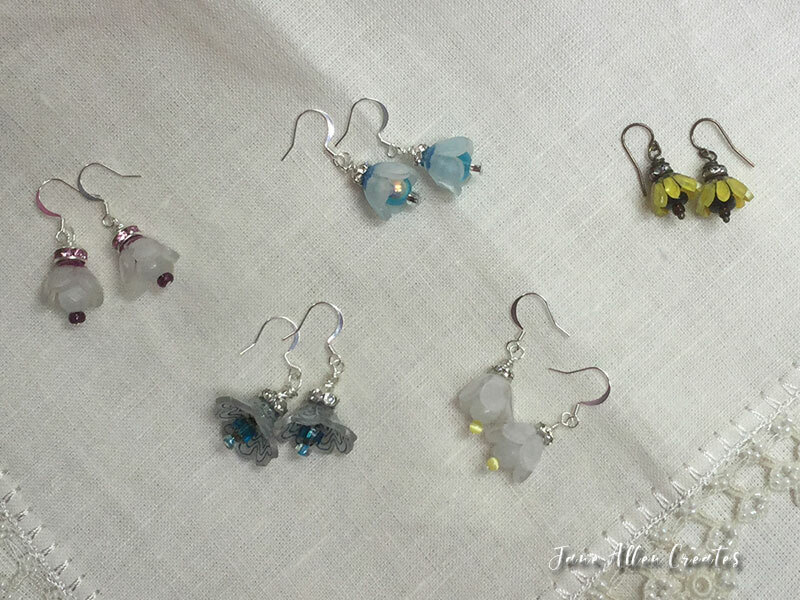 Many of the techniques are the same that we used in making other Shrinky Dink projects (See previous post here)…..but the secret to making these earring is using a Shrinket cone tool to make the dimensional floret beads. The tool is available from Julie Haymaker Thompson. This amazing tool allows you to create the bead shape right after they are heated but before they cool. But I am jumping ahead of things. To start, you need the right product – I like the Ruff N’ Ready Shrinky Dinks from Michaels. They are transparent – one side is shiny and the other is a matte finish. You then need to cut out the shape. For some of the earrings we used punches to cut out the flower shape. Julie also has patterns of different shapes that you can lay the Shrinky Dinks over, trace and then cut out. You can find the pattern on her site. You will then want to use an 1/8″ punch and put a hole in the center of each flower. Now to color the Shrinky Dinks. You can use colored pencils, markers, and paint on the flowers. On the centers of each of these flowers I used colored pencils. On the larger flower I went around the edges with a Stabilo pencil which is a water soluble pencil. The flower on the right is edged with the pencil, the flower on the left I used a brush with water and went around the edges. On these flowers I use Inktense water soluble pencils. The flower on the left is after I did my design and the flower on the right I used a brush with water on it. I was careful to not muddy the colors together. You can also use acrylic paints on the Shrinky Dinks. Since the shiny side is the finished side and the matte side the side you paint, I had to think about how to layer the paints. I added the center first and then went over the entire project with the second color. Once your flowers are prepared you will shrink them using a heat gun and the Shrinket dome tool. This is so fun you will not be able to stop yourself from creating. Place the bottom of the Shrinket tool on the wood block and insert wire into center. Place Shrinky Dink shiny side down over the wire. Using a heat gun, begin shrinking. Have a popsicle stick handy to prevent the Shrinky Dink from popping off of the wire. Continue heating until Shrinky Dink lies flat, then place top of tool over wire and press into bottom. Remove and release the Shrinket bead. Once you have created your Shrinket beads you can then assemble them into charms for earrings, bracelets, necklaces or whatever you choose. If you would like to learn more please stop over to Julie’s website. You can buy the Shrinket tool plus a lot of other great supplies. She also has a lot of great videos (much better than mine). Julie also teaches and lists the places she will be and the projects she will teach. If you are lucky enough to live in my area of South Central Pa, she will be teaching at Jean Van Brederode shop in Mechanicsburg August 25 – 27th. Here is a link to Jean’s Etsy store where you can purchase the classes. Those are amazing Jane! Thanks for sharing! Thank you Lynn, I think your grands could have fun with these. You can use rubber stamps with permeate ink or even run them through your printer. It is fun to see the shrink with either the heat gun or oven. Wow! So many possibilities! Thank you so much for sharing…. Thanks Amy, they are very fun and you just keep getting more ideas of how to use them…they are not just for kids. Check out Julie’s site she has some amazing things.